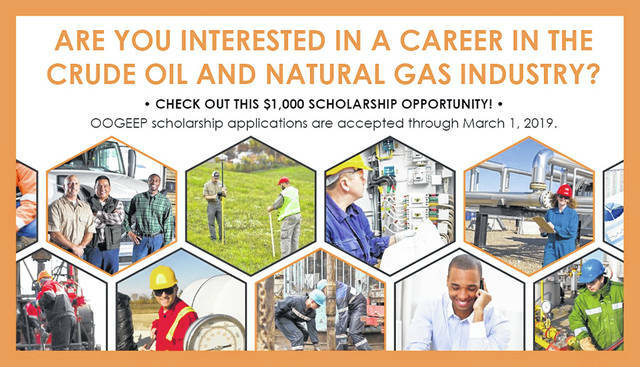 GRANVILLE, Ohio – The Ohio Oil and Gas Energy Education Program (OOGEEP) and the Ohio Oil and Gas Energy Education Foundation are accepting first-time and renewal applications for their 2019 Oil and Gas Energy Education Scholarships now through March 1. In 2018, OOGEEP awarded 21 renewal and 41 new scholarships to students attending accredited colleges, universities, and technical or trade schools of their choice. These renewable $1,000 scholarships are designated for students pursuing careers in the natural gas and crude oil industry. To be considered for a scholarship, students are required to submit an essay describing their personal and career goals in these industries along with letters of recommendation and meet other academic requirements. Detailed information about the scholarship can found on the OOGEEP website at https://www.oogeep.org/teacher-students/scholarships/. In addition to the scholarship program, OOGEEP works with more than 90 Ohio colleges, universities, and career and technical schools that offer training for the 75 plus careers serving the natural gas and crude oil industry. Scholarship winners are engaged in a variety of studies including geology, engineering, welding, business management, chemistry, and energy resource management. To learn more about careers in Ohio’s oil and gas industry, including the list of local colleges, universities, career tech and vocational schools offering oil and natural gas specific degrees, certificates and training, visit http://www.oogeep.org/industry-workforce/careers/. Links to OOGEEP’s recently launched “Oil and Gas Careers in Ohio” video series can be viewed at www.youtube.com/user/OOGEEP1. A list of previous winners can be found on the OOGEEP website at https://www.oogeep.org/teacher-students/scholarships/. The Ohio Oil and Gas Energy Education Program (OOGEEP) is a nonprofit statewide education and public outreach program. Created in 1998, OOGEEP provides a variety of programs throughout the state of Ohio. These programs primarily focus on teacher workshops, scholarships, science fair, firefighter training, industry training, career and workforce development, research and guest speaker programs. Submitted by the Ohio Oil and Gas Energy Education Program.